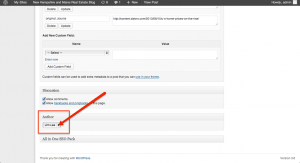 Adding Your Google+ Authorship Attribution to Your Dakno WordPress Blog Just Became Easier! 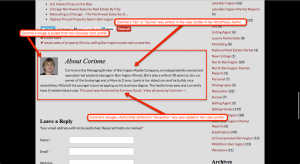 More on adding your Google+ Authorship to your WordPress blog deeper in the post. First, we have more great news for Dakno WordPress blog owners! The Dakno Development team recently announced new enhanced theme design options along with the 3.6 WP update to our client’s WordPress blogs. Read all the details of these updates and enhancements here at the Dakno Updates Blog. At a glance, here are a few of the highlights of that post. We’ve even given you more options how to format the design layout of the homepage of your blog. 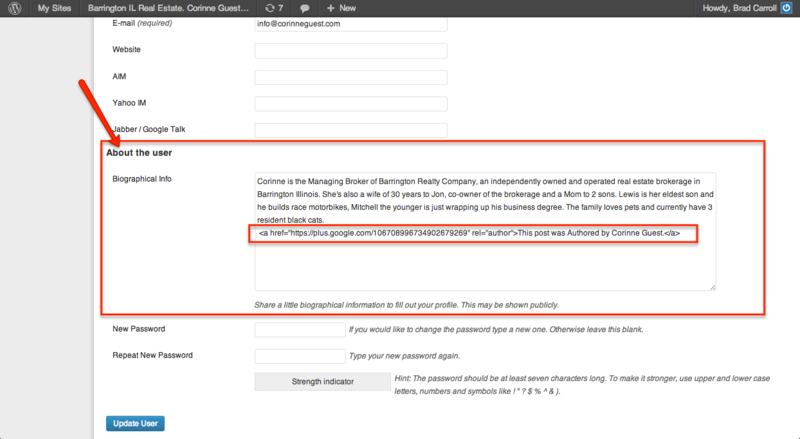 Plus, we made it easier to add your Google+ Authorship tag (rel=author). One of the cool new features you may have noticed on your Dakno blog was the addition of a byline at the bottom of each single post. This byline includes the author’s name, a bio and the author’s image or “gravatar”. If your blog byline still has a “gray ghost” for your image, that means you don’t have a gravatar. The easiest way to add your “gravatar” is to set up your profile with your photo at gravatar.com. It’s really easy to set up! 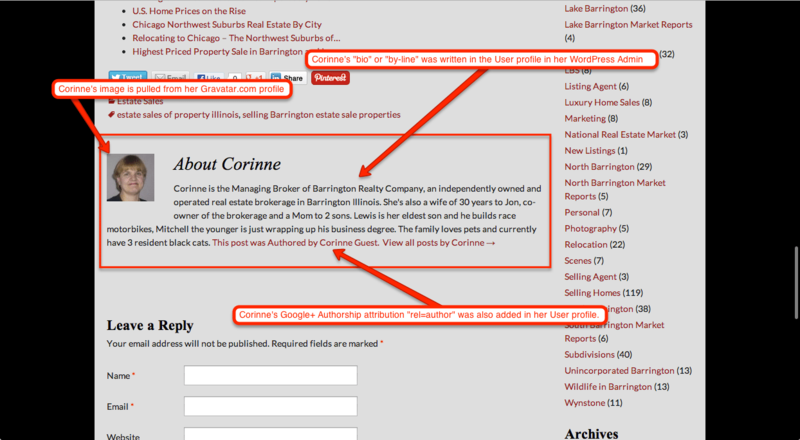 Check out Barrington, IL Realtor Corinne Guest byline in the image to the right! The new addition of the byline makes it really easy to add your “re=author” Google+ Authorship “tag” or snippet to your blog post (see image above). 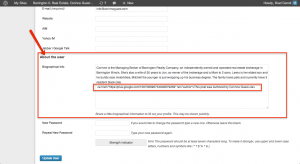 For multiple authored blogs, this makes adding your Google+ Authorship tag really easy. Dakno clients like Jim Lee and Ann Cummings who share their www.newhampshiremainerealestate.com blog will now have the ability to add their Google+ Author tag each time one of them post. As the image to the right indicates, Ann or Jim can simply select who the “Author”is in the post admin drop down select. Clearly, Dakno clients now enjoy enhanced design features and new search engine optimization (SEO) options with their Dakno WordPress blogs. The ultimate benefits of these recent changes and improvements means it’s easier to implement your Google+ Authorship Attribution on your WordPress blog built by Dakno and have your Google+ image added to your search results. In light of this recent post by Google, real estate agents need to restructure their Google+ Authorship “if” their Authorship tag was coded for the entire site (including IDX pages). Google specifically mentions that property listings should NOT have the Authorship annotation. What impact could this have if ignored? Could this incur a Google penalty if your IDX pages are tagged with rel=author? Who knows, but why tempt fate? Providing up to date WP tools ensures your blog is prepared for any competitive real estate market. Stay tuned! We are working on even more no-cost enhancements for your Dakno website, WordPress and DaknoIDX! 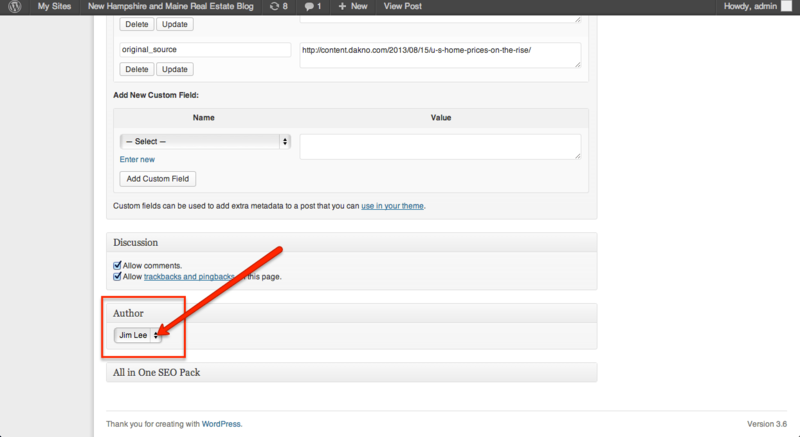 Have Questions About Dakno Real Estate WordPress Blogs? Be sure to use the comments option below if you have any questions or observations about your Dakno WordPress blog.